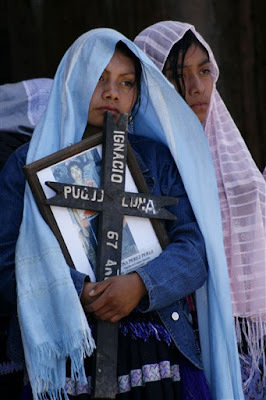 Relatives of those killed in the 1997 Acteal massacre carry photos and pray in San Cristobal, Chiapas, Mexico, Tuesday, August 11, 2009. Photo by Moyses Zuniga / AP. MEXICO CITY -- With immense sorrow etched into his weather-beaten face, the Tzotzil Indian farmer slowly mounted the imposing granite steps of Mexico's Supreme Court. Sebastian Perez Vazquez's job was a thankless one. As president of the civil group "Las Abejas" ("The Bees"), he was obligated to communicate the bad news to the villagers who had trekked up to the capital from their homes in the highlands of Chiapas ("Los Altos") that, after 12 years, the killers who had been convicted of murdering their mothers and fathers and grandparents and children at Acteal on December 22nd 1997 would now be freed from prison on the instructions of four out of five Supreme Court justices because of procedural errors in their prosecutions. The Abejas had dressed in their best clothes for the court hearing, the men in their short ornamental "chujs" (serapes) and the women in their finest huipiles (traditional blouses) and long embroidered skirts they wear like a proud emblem of their Tzotzil roots but they had not even been allowed inside the courtroom to bear witness to the verdict of the justices. Heavily armed federal police patrolled the marble hallways of the court building on one corner of Mexico City's great Zocalo plaza intent on keeping the Indians out in the street. Elena Perez Perez looked like the air had been sucked out of her. She had expected the exoneration of the killers but still could not staunch the tears that washed her bladed cheekbones. "We cry because we cannot find justice anywhere," Elena, who was 19 when the accused murdered her father and two eldest siblings, told a U.S. reporter. Maria Vazquez had lost nine family members in the massacre. She too had expected the justices' decision. "This court releases the killers but it cannot resuscitate the dead." Early on the morning of December 22nd, 1997, three dozen armed men gathered on a lonely roadside in Chenalho county in the Altos of Chiapas, Mexico's southernmost state, and began firing on women and children clustered around a clapboard chapel who were praying for peace on a promontory below. A detachment of 40 Chiapas police officers were stationed at a schoolhouse just meters away but made no effort to stop the killing. The gunfire continued for the better part of the day, the shooters scouring the hillside for those who had escaped the first assault and finishing them off one by one. When they were done seven hours later, 49 Abejas were dead: 15 children, 21 women, nine men, and four babies who had been cut out of the wombs of their mothers and dashed against the rocks. The killers were determined to exterminate the "seed" of the Abejas. The outside world learned of the massacre at Acteal when survivors straggled into San Cristobal de las Casas, the old colonial city that crowns the highlands, several hours later. A call went out to doctors to come to the Civil Hospital to treat the many wounded. One medic who responded to the call was Hermann Bellinghausen who doubles as correspondent for the left daily La Jornada in Chiapas. Hermann has accompanied the rebellion of the Zapatista Army of National Liberation (EZLN) since it exploded in the mountains and jungle of this deeply indigenous state on January 1st 1994. The Abejas were supporters of the Zapatistas but rejected the insurgents' use of weapons. Around 10 p.m. that night, a Red Cross ambulance braved gunfire to reach the village of Acteal enclaved in the saw-toothed mountains about 45 minutes above San Cristobal and discovered state police officers stacking the corpses of the Indians, apparently preparing them for burning. Caught in the act, the cops gathered up the bodies and tossed them in a dump truck where they were driven down to the state capital in Tuxtla Gutierrez for "autopsies." The contamination of the crime scene was corroborated by Bellinghausen and two colleagues Jesus Ramirez Cuevas and Juan Balboa the next morning and later that day, Hermann posted his first dispatch. Bellinghausen would go on to write a book, Acteal: A Crime of State that has become a definitive text on understanding the massacre. The Abejas are a civil association of honey gatherers and coffee growers who had been forced from their home villages in the months previous to the murders -- the massacre took place at the height of the coffee harvest -- by armed bands affiliated with the long-ruling PRI party and its surrogates in the "Cardenas Front." Unlike the Abejas who were devout Catholics, the PRIistas lined up with the evangelical National Presbyterian Church that first established itself in Los Altos back in the 1930s. Since spring, they had been burning the Bees' homes and stealing their coffee and their cattle. Abeja families from Quextic had been particularly persecuted and the Zapatista community of Acteal offered them sanctuary on the hillside where they would later be murdered. All of the dead Abejas and those who killed them were Tzotzil Mayan Indians. Although they supported the EZLN's struggle, the Abejas' allegiances were to the liberation bishop of San Cristobal Samuel Ruiz who had been instrumental in their formation. The Bees were indeed a Sui Genero grouping amongst the Tzotziles of Los Altos. They were resolutely non-violent and eschewed the "posh", sugar-cane aguardiente that is obligatory in many highland villages. Unlike their neighbors, they defended the right of women to own land in the community. Bellinghausen's reportage triggered a chain reaction of indignation around the world. Demonstrators circled Mexican embassies in European cities. Pope John Paul II expressed his grief and U.S. president Bill Clinton lamented the violence. International human rights workers flocked to Chiapas. As commander-in-chief, Mexican president Ernesto Zedillo ordered U.S.-trained troops into the Chiapas highlands to restore order and separate the paramilitaries responsible for the massacre from the EZLN -- the military invaded dozens of Zapatista villages purportedly looking for weapons but, at first, left the paramilitaries alone. Fear of a new massacre panicked villagers and 10,000 Indians abandoned their homes and sought refuge in Polho, a Zapatista refugee camp. The bodies of the dead were returned to the Abejas on Christmas day for burial. As the funeral procession advanced up the mountain road from Polho to Acteal, the mourners encountered a truck speeding in the opposite direction that was carrying stolen Abeja coffee. The Abejas recognized the men in the truck as their killers -- many of them were PRIistas who had run them off their land and at least one was the cousin of a victim. Bishop Ruiz moved swiftly to prevent a lynching and 24 of the presumed assassins were taken into custody. They would not be released until the Supreme Court's August 12th decree a dozen years later. Other suspects were rounded up by federal police during raids in Los Chorros, Quextic, and Pechiquil. One old Indian farmer was reportedly handed a list of 100 suspects and forced to sign it. Agustin Luna did not read or write Spanish. According to Zedillo's attorney general Jorge Madrazo Cuellar, 124 arrest warrants were issued but apparently only 87 were ever served. Almost all of those who were taken into custody were Tzotziles -- 14 mostly mestizo public servants served less than six years for their roles in the massacre. Two high-ranking Mexican Army officers who functioned as commandants in Chiapas public security agencies simply disappeared and more than a decade later remain at large. The Indians were heavily punished for the killings, dealt 20 to 40 year sentences for premeditated homicide and possession of weapons that only the military was licensed to carry. Two of the 70 Tzotzil defendants were let go because of old age and another died in custody. Several more were re-sentenced and released. Of the 57 Indians who remained in prison only five confessed to participating in the massacre. There is little question that the prosecution of those rounded up for the killings at Acteal was slipshod. Witnesses were pressured and declarations obtained by force. In the Zedillo government's rush to judgment, many were swept up who were not in Acteal on the day of the massacre. Translators who are required by law to be available to defendants who do not speak Spanish were not. Weapons were seized that did not match the caliber of the bullets that killed the Bees. The Supreme Court decried the disappearance of evidence and the destruction of the crime scene and the falsification of testimony. To mark the first anniversary of the killings, Madrazo's Federal Prosecutor's Office (PGR) published The White Book of Acteal that blamed the murders on "inter-communal conflicts" and underscored the savage nature of the killings, intimating that the violence had cultural roots. Although many of the victims had been brutally slashed by machete blows, one autopsy lists gunshot wounds as the cause of death for 43 of the slain villagers and writer Carlos Montemayor, an outspoken defender of indigenous culture, concluded that the bodies of the Abejas were further brutalized by police to emphasize the "primitive" nature of the Indians. Madrazo's White Book absolved the Zedillo government of all crimes of commission and omission. Once convictions were obtained and the presumed killers sentenced, Acteal was relegated to the cold case file. Although the PRI quickly washed its hands of the prisoners, the National Presbyterian Church soon came to their defense. The evangelicals' point man was an influential politico and preacher Hugo Eric Flores who is described as being close to the "theology of prosperity." During the 2006 presidential campaign, Flores, the founder and "moral leader" of Encuentro Social ("Social Encounter"), an evangelical political association that had been tied to the PRI, met with right-wing PAN party candidate Felipe Calderon and offered to deliver the evangelical vote (the PAN had none) if Calderon would agree to reopen the cases of those he described as "political prisoners." According to La Jornada op-ed editor Luis Hernandez Navarro, the deal went down that April. Months later, after Calderon had been awarded the fraud-marred election, Hugo Eric Flores emerged as the director of the Environmental Secretariat's PRO-ARBOL ("pro-tree") program but within a year was fired from the post and barred from working for the agency for the next ten years. No explanation has ever been offered for Flores' removal but despite the stain on his resume, the evangelical preacher had no difficulty finding ">chamba>" ("work") and today serves as back-up ("suplente") for a PANista senator. Soon after he was fired from his environmental sinecure, Hugo Eric Flores hired on with the prestigious Center for Investigation & Teaching of Economics (CIDE), an entity of the Secretary of Public Education, and published a defense of those convicted for the Acteal massacre, "The Other Acteal," chapters of which appeared in Nexos magazine, a glossy monthly edited by the prominent PRIista writer and Televisa talking head Hector Aguilar Camin who in 1997 on the tenth anniversary of the killings published his own three part vindication of the incarcerated paramilitaries. Amongst Aguilar Camin's revelations: there had been no massacre at Acteal, a hypothesis that rested largely on the testimony of Lorenzo Perez Vazquez who at 17 was the youngest of the convicted killers. According to Perez, the Abejas were caught in a crossfire between the Zapatistas and PRIistas. Lorenzo Perez himself was one of the five paramilitaries who confessed to the murders. Notwithstanding, his name was listed among the first batch of 20 the Supreme Court set free. Eric Flores used his growing clout to recruit young lawyers from the CIDE's law clinic and in December 2007, the same month as Aguilar Camin's vindication appeared, they officially filed an appeal for the release of the 57 imprisoned indigenas, citing discriminatory treatment of Indians by the courts. According to the CIDE's general secretary Dr Sergio Lopez Ayllon, the legal costs were offset by sizable grants from both the Hewitt Foundation and George Soras' Open Society Institute. How many of those released actually have blood on their hands? Miguel Angel De los Santos, a prominent human rights attorney in San Cristobal, thinks that the government case was so "flojo" (lazily assembled) that separating the guilty from the innocent at this late date may be next to impossible -- in the Mexican justice system, "fabricando cupables" (literally "manufacturing the guilty") is an "art form." De los Santos charges that government prosecutors often leave big holes in unpopular cases to establish grounds for appeal and ultimately absolution of the perpetrators. "The release of the accused paramilitaries," he writes in La Jornada, "is a confession of the Mexican state's fracaso in the impartation of justice." During a decade and more, imprisoned first at the crumbling old Cerro Hueco fortress above Tuxtla, those convicted of the Acteal murders (the "material assassins" in legal jargon) have been demonized by the Abejas and the Zapatistas and their supporters as cold-blooded killers -- the phrase "paramilitary" is an ugly curse in the rebels' lexicon and those who suggest that some of those railroaded by the Zedillo government's inept prosecution are not guilty are deemed "politically incorrect." On the other hand, government officials who conceived, put in motion, and covered up the Acteal killings -- "the intellectual authors" -- have evaded justice for a decade. At the top of the list is ex-president Ernesto Zedillo whose xenophobic jeremiads against non-Mexican human rights workers animated a lethal atmosphere of fear and loathing in Chiapas. As commander-in-chief of Mexico's Armed Forces, Zedillo signed off on the counterinsurgency initiative that culminated with the massacre at Acteal. The former Mexican president now heads up the Yale University Globalization Studies Institute and sits on the board of major U.S. corporations. Zedillo's Secretary of Defense and the commander of Mexican Army forces in the region Mario Renon Castillo collaborated on a "Chiapas Campaign Plan." a counterinsurgency strategy to develop paramilitary groups in 39 municipalities in which the EZLN had influence. Renon Castillo is a graduate of Center for Special Forces in Fort Bragg, North Carolina, where he was trained in counterinsurgency warfare. According to diplomatic cables unearthed by investigator Kate Doyle at the Washington-based National Security Archives, the Mexican military trained and financed paramilitaries in Chenalho -- one corporal was briefly jailed as a trainer. Chiapas Governor Julio Ruiz Ferro, a Zedillo appointee, had ample prior knowledge of the violence brewing in the highlands and did nothing to head it off -- the deaths of 32 Indians in Chenalho in the months before the massacre set the stage for Acteal. Ruiz Ferro was bumped up to agricultural attaché at Mexico's Washington embassy after he resigned as governor as reward for his inattention. Interior Secretary Emilio Chuayffet, who supervised national security, was forced to resign for failing to anticipate Acteal but remained active in the PRI hierarchy and may soon become head of the PRI's majority delegation in the lower house of congress. Former Attorney General Jorge Madrazo's flawed prosecution may have jailed innocent Indians for a dozen years -- the National Fraternity of Christian Churches now demands that he be incarcerated. Finally, suggests Raul Vera, auxiliary bishop of San Cristobal during Acteal, by freeing the accused killers, the justices of Mexico's Supreme Court are now "accomplices" in this lurid plot. Although the Supreme Court did not rule on the innocence or guilt of the prisoners and only considered the poisoned judicial procedures, 20 of the accused killers were released August 13th from El Amate prison on the western edge of Chiapas and transported to a small hotel outside of Tuxtla Gutierrez where they met with worried state officials behind closed doors for 12 hours. Authorities are fearful that the ex-prisoners will return to Chenalho and seek revenge against the Abejas for their long incarceration. Indeed, fear permeates Acteal and Polho in the wake of the prisoners' release -- the Abejas have long charged that the paramilitaries still have weapons cached in the region. "I survived the first time but I won't survive another massacre," Catalina Perez, who was shot nine times during the attack, told La Jornada. The freed Indians are also under the gun. If they were not the real killers then they know who the real killers were and local "caciques" (rural bosses) will try to silence them. Governor Juan Sabines, whose father was also Juan and served as Chiapas governor when dozens of Indians were gunned down by army troops in another massacre at Wolonchan in 1981, vowed that the prisoners' release would not rupture the fragile calm in the state. The ex-prisoners would be relocated as far from Chenalho as the borders of Chiapas would allow and provided with land and animals and generous pensions. Even though the accused were being closely watched by state officials, by week's end six had already escaped for parts unknown. Conspicuously absent from the controversy over the released paramilitaries is the EZLN which has yet to comment on the Supreme Court decision. The Zapatistas' key public outpost in the highlands at Oventic has been reportedly closed to outside visitors since the Supreme Court ordered the paramilitaries released from prison. Since the evangelical Summer Language Institute was installed in Los Altos by President Lazaro Cardenas in the 1930s, the political clout of the "sects" as the Catholic Church labels the Protestants has grown precipitously. Each Sunday, the Army of God marches in military cadence through San Cristobal. With their red berets, spit-shined army boots, and camouflage cargo pants, the marchers are dead ringers for paramilitaries but Army of God commander-in-chief Esdras Alonso, a fiery highland preacher with connections to the National Presbyterian Church, claims that his followers are armed only with the "Word of God." According to Bellinghausen, Esdras Alonso's home base is in San Cristobal's Hormiga Colony where the killers of the Abejas are said to have acquired their weapons. Reverend Esdras also claims that fallen-away Zapatista comandantes have joined the Army of God. Alonso's evangelicals have considerable influence in Mitziton just outside San Cristobal which Governor Sabines has designated as the starting point for a super highway that will connect up the tourist corridor between that old colonial city and the fabled Mayan ruins at Palenque in the lowlands to the east. Although the actual route remains under wraps, the new highway is expected to invade autonomous Zapatista communities and tensions are running tall in Mitziton where farmers are aligned with the EZLN's "Other Campaign." This past July 21st, when ski-masked protestors blocked road-building equipment, the Army of God counterattacked, killing one villager. Commander-in-chief Esdras responded to unfavorable news coverage of the confrontation by filing a complaint with the local prosecutor against both the Fray Bartolome Human Rights Center, founded by Bishop Ruiz, and Hermann Bellinghausen for allegedly spreading libelous rumors on the Internet. Esdras also demanded that Immigration authorities investigate Bellinghausen's immigration status -- the Jornada reporter is a third generation Mexican. The Supreme Court's decision to free those convicted of killing 49 Abejas at Acteal is the latest finding of the high court to grant impunity to those deemed responsible for notorious crimes. In 2006, the court barred citizens from access to ballots cast in the presidential elections, one of the most egregious frauds in Mexican electoral history. In 2007, the justices absolved Puebla governor Mario Marin after evidence implicated him in the kidnapping of independent journalist Lydia Cacho who had blown the whistle on the governor's pederast associates. In 2008, the Supreme Court declared Mexico state governor and current PRI presidential front runner Enrique Pena Nieto innocent of ordering state mayhem at San Salvador Atenco where 200 protesters were attacked and arrested, a score of women sexually abused by Pena Nieto's police, and two young men gunned down by the cops. Later that year, the justices concluded that Oaxaca governor Ulysis Ruiz had used "legitimate" force to suppress protests by the Oaxaca Peoples Popular Assembly or APPO during which 26 civilians lost their lives. Just a week before the Acteal ruling, the Supreme Court concurred that a Sinaloa woman whose husband had been shot down at an Army checkpoint bad no standing and turned the matter over to a military tribunal that has no civilian oversight. By sustaining the military's "fuero" or immunity from prosecution by civil authorities, the court assured the army of continued impunity. Release of those prisoners sentenced for the Acteal massacre because of judicial errors will have far reaching impact on Mexican courts observes Barbara Zamora, lawyer for the prisoners of Atenco and other high profile government targets. Zamora affirms that she has never defended a case that was not contaminated by gross judicial error. "The Mexican judicial system is rotten to the core. But from now on, whether they are guilty or not, anyone who can afford a powerful lawyer and has been sentenced for homicide, narco, kidnapping, or organized crime will be able to claim judicial impropriety and appeal to the Supreme Court to be set free. This could empty out the jails," the lawyer adds with a mischievous smile.